There are two important lighthouses on the Kõpu Peninsula of Estonia's western Hiiumaa Island. The Ristna lighthouse was put up at the westernmost tip of the peninsula in 1874. In 1920, the lower part of the lighthouse was encased in concrete up to the service level, so now the 30-m lighthouse can be described as a reinforced concrete structure. It is located at 58° 56,40' N and 22° 03,31' E.
About 9 km east of Ristna stands Kõpu lighthouse, the oldest in Estonia. Its history goes back to 1500. The lighthouse was completed in 1531. 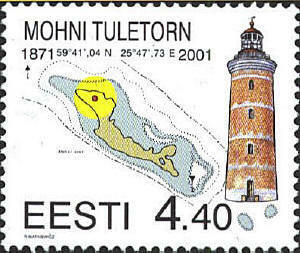 The coordinates of the Kõpu lighthouse are: 58° 54,96' N and 22° 11,98' E.
The lighthouse on the little island of Mohni was begun in the 19th century. It was rebuilt in 1871. Two stories were added and the lighting system improved. The present lighthouse is 27.4 meters high. It is located at 59°41’N 25°47’E.